Southern Tier Creme Brulee Imperial Milk Stout – Ep. 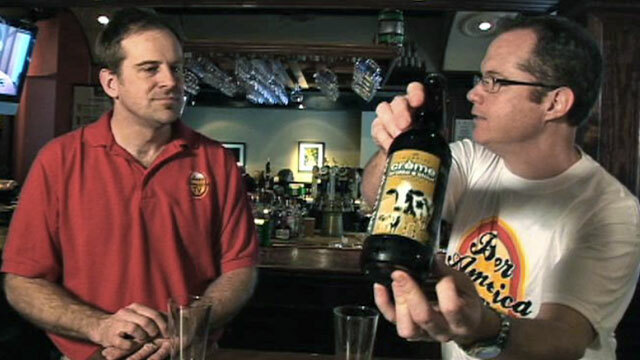 99 | Beer America TV - Craft Beer in Motion! If you like Creme Brulee, then this beer will knock you off your feet! Close your eyes and pour this beer into a glass and you would swear that someone put the actual desert right down in front of you! Now it’s not as sweet to drink, but this is a true milk stout with a nice blend of malt and hops utilizing 2-row pale malt, dark caramel malt , vanilla bean, and actose sugar, as well as kettle hops: columbus, aroma hops: horizon. A very unique beer to say the least!! Good show guys! Sounds like an interesting beer. Its always good to see you tasting beers from my neck of the woods (Corning, NY). Have you guys had the opportunity to try anything from Horseheads Brewing? They have a very nice variety and probably one of the best seasonal pumpkin beers I have had the pleasure to sample. p.s. Are either of you guys going to make it to any of the NY beer festivals this summer? If so I would love to meet you in person. Bill, I don’t think we’re going to make it to NY this year unfortunately. I moved to Fort Worth Texas and usually spend a few weeks every summer back in NY state, but this year is just to busy. I’ll let you know if I do however, it would be nice to meet you too!